1 1. Have the Ecology Honor. 2 2. State the first and second laws of thermodynamics and explain how they are important to ecology. 3 3. Explain the three basic trophic (feeding) levels and give a good example of a plant or animal for each. 4 4. Explain or diagram the three types of ecological pyramids in the food web. Give an example of each layer of the pyramid. 5 5. Define the biogeochemical cycle, and explain or diagram all the basic components the cycle passes through. 6 6. Diagram or explain the basic steps in the flow of energy through the biotic environment (element) of an ecosystem. Begin with the sun. 7 7. Explain Liebig's Law of The Minimum and Shelford's Law of Tolerance, and state how these laws tell us how and why certain plants and animals become endangered or are eliminated when their habitat or community gets disturbed OR out of balance. 8 8. Choose a biological community in your area, such as a forest or woods; a swamp, lake or pond; pasture or meadow grassland; or a canyon or creek woods, etc., that is disturbed or ecologically out of balance in some way. Make a description of it, including how and to what extent it is disturbed. Then make recommendations as to how the community could be improved and, where possible, follow through and help to improve it in some way. 9 9. Spend a minimum of 20 hours doing active, productive work on an ecology project in your area. This may be done individually or as a group. Describe the project in general, but report specifically on your part in it. 11 11. Find a Spirit of Prophecy quotation and a Bible text pertinent to ecology and explain their relevance and application to our day. 14 NOTE:These requirements may be expressed either verbally or in writing to a youth leader. An instructor is recommended but not required for this honor. Counsel with your youth leader or instructor before beginning requirements seven, eight and nine. The Ecology - Advanced Honor is a component of the Conservation Master Award . 1. Have the Ecology Honor. Instructions and tips for earning the Ecology honor can be found in the Nature chapter. 2. State the first and second laws of thermodynamics and explain how they are important to ecology. More simply, the First Law states that energy cannot be created or destroyed; rather, the amount of energy lost in a steady state process cannot be greater than the amount of energy gained. This is the statement of conservation of energy for a thermodynamic system. It refers to the two ways that a closed system transfers energy to and from its surroundings - by the process of heating (or cooling) and the process of mechanical work. The rate of gain or loss in the stored energy of a system is determined by the rates of these two processes. In open systems, the flow of matter is another energy transfer mechanism, and extra terms must be included in the expression of the first law. In an ecological sense, the first law shows that a creature's energy must come from somewhere, and it must go somewhere as well. Primary producers transfer energy from the sun to primary consumers to secondary consumers at the top of the food chain. All along the way, some of the energy is dissipated in the form of heat. One can look at entropy as a measure of chaos or disorder. A high level of entropy means a high level of disorder. A low level of entropy means a high level of order. So, for example, a broken cup has less order and more chaos than an intact one. Likewise, solid crystals, the most organized form of matter, have very low entropy values; and gases, which are highly disorganized, have high entropy values. More to the point, a tree is a highly organized biological unit, but when it burns, the most pf its energy is transformed into heat, which is highly disorganized. The second law states that the disorder of an isolated system increases, or that the order in that system decreases. It becomes more chaotic over time. The science of thermodynamics deals with energy transfer. The second law dictates that when energy is transferred from one state to another, the entropy of the universe must increase. A good example would be when a warm-blooded animal gives off heat. The energy starts off in a highly organized form within the animal. As the animal metabolizes its food energy and forms heat, the heat radiates from the animal in a highly disorganized form. Any time energy is transferred from one organism to another, some of that energy is lost, mostly in the form of heat. In fact, only about 10% of the energy from an organism at a low trophic level can be transferred to an organism at the next trophic level. Because of this inefficiency, trophic levels always appear as pyramids, with the primary producers forming the base, and the secondary and tertiary consumers forming the apex. 3. Explain the three basic trophic (feeding) levels and give a good example of a plant or animal for each. The three basic trophic levels are primary producers, primary consumers, and secondary consumers. In land-based ecosystems, plants such as grass are the primary producers and form the first trophic level (primary producers). Next are herbivores (primary consumers) that eat the grass, such as rabbits. Next are carnivores (secondary consumers) that eat the rabbits, such as a bobcats. Keep in mind that trophic relationships are rarely this simple. Very often they are more of a "web" than a "chain." For example, mountain lions may eat both rabbits and bobcats. The trophic categorization of the mountain lion exists on two levels, possibly more. 4. Explain or diagram the three types of ecological pyramids in the food web. Give an example of each layer of the pyramid. A number pyramid attempts to illustrate trophic relationships by showing the number of organisms at each trophic level. The number of grass plants will always be higher than the number of zebras, which will be higher than the number of lions. Number pyramids tend to overemphasize the importance of the lower levels because it does not take into account the size of the organisms, only the count. Number pyramids quantify each level using organisms per square meter. A biomass pyramid illustrates trophic relationships by showing the amount of biological mass (excluding water) at each tropic level. This is an improvement over the number pyramid, but it still tends to overemphasize the importance of the lower levels because it does not account for the productivity of each level. In the ocean, algae forms the base of the food pyramid. And though algae is short lived, it reproduces very quickly. This causes it to have a biomass that is actually less than the biomass of the zooplankton, the next higher trophic level. Zooplankton lives much longer than algae, and it has a slower rate of reproduction. Biomass pyramids often quantify each level using grams per square meter. An energy pyramid illustrates trophic relationships by showing the amount of energy available at each trophic level. Because not all energy is transferred up the pyramid, it also shows the efficiency of each level. Energy pyramids often quantify each level using calories per square meter. 5. Define the biogeochemical cycle, and explain or diagram all the basic components the cycle passes through. In ecology and Earth science, a biogeochemical cycle is a circuit or pathway by which a chemical element or molecule moves through both biotic ("bio-") and abiotic ("geo-") compartments of an ecosystem. In effect, the element is recycled, although in some such cycles there may be places (called "sinks") where the element is accumulated or held for a long period of time. All chemical elements occurring in organisms are part of biogeochemical cycles. In addition to being a part of living organisms, these chemical elements also cycle through abiotic factors of ecosystems such as water (hydrosphere), land (lithosphere), and the air (atmosphere); the living factors of the planet can be referred to collectively as the biosphere. All the chemicals, nutrients, or elements — such as carbon, nitrogen, oxygen, phosphorus — used in ecosystems by living organisms operate on a closed system, which refers to the fact that these chemicals are recycled instead of being lost and replenished constantly such as in an open system. The energy of an ecosystem occurs on an open system; the sun constantly gives the planet energy in the form of light while it is eventually used and lost in the form of heat throughout the trophic levels of a food web. The Earth does not constantly receive more chemicals as it receives light; it has only those from which it formed, and the only way to obtain more chemicals or nutrients is from occasional meteorites from outer space. Because chemicals operate on a closed system and cannot be lost and replenished like energy can, these chemicals must be recycled throughout all of Earth’s processes that use those chemicals or elements. These cycles include both the living biosphere, and the nonliving lithosphere, atmosphere, and hydrosphere. The term "biogeochemical" takes its prefixes from these cycles: Bio refers to the biosphere. Geo refers collectively to the lithosphere, atmosphere, and hydrosphere. Chemical, of course, refers to the chemicals that go through the cycle. The chemicals are sometimes held for long periods of time in one place. This place is called a reservoir, which, for example, includes such things as coal deposits that are storing carbon for a long period of time. When chemicals are held for only short periods of time, they are being held in exchange pools. Generally, reservoirs are abiotic factors while exchange pools are biotic factors. Examples of exchange pools include plants and animals, which temporarily use carbon in their systems and release it back into the air or surrounding medium. Carbon is held for a relatively short time in plants and animals when compared to coal deposits. The amount of time that a chemical is held in one place is called its residence. The most well-known and important biogeochemical cycles, for example, include the carbon cycle, the nitrogen cycle, the oxygen cycle, the phosphorus cycle, and the water cycle. Biogeochemical cycles always involve equilibrium states: a balance in the cycling of the element between compartments. However, overall balance may involve compartments distributed on a global scale. Schematic representation of the flow of nitrogen through the environment. The nitrogen cycle is a much more complicated biogeochemical cycle but also cycles through living parts and nonliving parts including the water, land, and air. Nitrogen is a very important element in that it is part of both proteins, present in the composition of the amino acids that make up proteins, as well as nucleic acids such as DNA and RNA, present in nitrogenous bases. The largest reservoir of nitrogen is the atmosphere, in which about 78% of nitrogen is contained as nitrogen gas (N2). Nitrogen gas is “fixed,” in a process called nitrogen fixation. Nitrogen fixation combines nitrogen with oxygen to create nitrates (NO3). Nitrates can then be used by plants or animals (which eat plants or eat animals that have eaten plants). Nitrogen can be fixed either by lightning, industrial methods (such as for fertilizer), in free nitrogen-fixing bacteria in the soil, as well as in nitrogen-fixing bacteria present in roots of legumes (such as rhizobium). Nitrogen-fixing bacteria use certain enzymes that are capable of fixing nitrogen gas into nitrates and include free bacteria in soil, symbiotic bacteria in legumes, and also cyanobacteria, or blue-green algae, in water. After being used by plants and animals, nitrogen is then disposed of in decay and wastes. 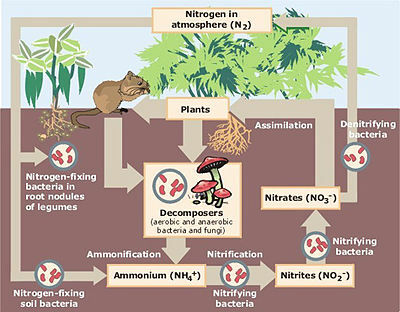 Detritivores and decomposers decompose the detritus from plants and animals, nitrogen is changed into ammonia, or nitrogen with 3 hydrogen atoms (NH3). Ammonia is toxic and cannot be used by plants or animals, but nitrite bacteria present in the soil can take ammonia and turn it into nitrite, nitrogen with two oxygen atoms (NO2). Although nitrite is also unusable by most plants and animals, nitrate bacteria changes nitrites back into nitrates, usable by plants and animals. Some nitrates are also converted back into nitrogen gas through the process of denitrification, which is the opposite of nitrogen-fixing, also called nitrification. Certain denitrifying bacteria are NOT responsible for this. 6. Diagram or explain the basic steps in the flow of energy through the biotic environment (element) of an ecosystem. Begin with the sun. Energy and matter flows through an ecosystem (adapted from the Silver Springs model; Odum 1971). H are herbivores, C are carnivores, TC are top carnivores, and D are decomposers. Squares represent biotic pools and ovals are fluxes or energy or nutrients from the system. 7. Explain Liebig's Law of The Minimum and Shelford's Law of Tolerance, and state how these laws tell us how and why certain plants and animals become endangered or are eliminated when their habitat or community gets disturbed OR out of balance. Liebig's Law of the Minimum, often simply called Liebig's Law or the Law of the Minimum, is a principle developed in agricultural science by Carl Sprengel (1828) and later popularized by Justus von Liebig. It states that growth is controlled not by the total of resources available, but by the scarcest resource. This concept was originally applied to plant or crop growth, where it was found that increasing the amount of plentiful nutrients did not increase plant growth. Only by increasing the amount of the limiting nutrient (the one most scarce in relation to "need") was the growth of a plant or crop improved. Liebig used the image of a barrel—now called Liebig's barrel—to explain his law. Just as the capacity of a barrel with staves of unequal length is limited by the shortest stave, so a plant's growth is limited by the nutrient in shortest supply. Liebig's Law has been extended to biological populations (and is commonly used in ecosystem models). For example, the growth of an organism such as a plant may be dependent on a number of different factors, such as sunlight or mineral nutrients (e.g. nitrate or phosphate). The availability of these may vary, such that at any given time one is more limiting than the others. Liebig's Law states that growth only occurs at the rate permitted by the most limiting. Shelford's Law of Tolerance states that a species' distribution is controlled by the environmental factors for which it has the narrowest tolerance. This law explains why a species is present in some areas, but absent in others. Remember that tolerance has both a lower limit and an upper limit - not enough or too much of a resource will limit a species' ability to survive. When any one of these factors exceeds the tolerance, the species will die out. Small - and even major - alterations to a creatures environment may or may not cause it to die. Survival depends on that creature's tolerance to the altered factor. 8. Choose a biological community in your area, such as a forest or woods; a swamp, lake or pond; pasture or meadow grassland; or a canyon or creek woods, etc., that is disturbed or ecologically out of balance in some way. Make a description of it, including how and to what extent it is disturbed. Then make recommendations as to how the community could be improved and, where possible, follow through and help to improve it in some way. This requirement and requirement 5 of the Environmental Conservation honor can both be met with the same activity. Any Pathfinder interested in Ecology should also find an interest in Environmental Conservation, so it would be advantageous to work on both the honors at the same time. Also, both these honors (and Ecology, which is a prerequisite to this honor) count towards the Conservation Master Award, so there is added impetus to earn them both. 9. Spend a minimum of 20 hours doing active, productive work on an ecology project in your area. This may be done individually or as a group. Describe the project in general, but report specifically on your part in it. This project could be the one identified in the previous requirement, or it could be a different project all together. The report may be written or oral, or it may be a presentation made to a group of Pathfinders during a campout, a Sabbath School class, or even to the church body on Sabbath morning. In ecology, a community is an assemblage of populations of different species, interacting with one another. Raw materials are the materials an organism needs but cannot manufacture on its own. They must found in the organism's environment. Photosynthesis is the conversion of light energy into chemical energy by living organisms. The raw materials are carbon dioxide and water, the energy source is sunlight, and the end-products include glucose and oxygen. It is arguably the most important biochemical pathway, since nearly all life depends on it. Chemosynthesis is the biological conversion of one or more carbon molecules (usually carbon dioxide or methane) and nutrients into organic matter using the oxidation of inorganic molecules (e.g. hydrogen gas, hydrogen sulfide) or methane as a source of energy, rather than sunlight, as in photosynthesis. Large populations of animals can be supported by chemosynthetic primary production at hydrothermal vents, methane clathrates, cold seeps, and whale falls. Autotrophy (from the Greek autos = self and trophe = nutrition) is the production of complex organic compounds from simple inorganic molecules and an external source of energy, such as light or chemical reactions of inorganic compounds. Autotrophs are considered producers in a food chain. Plants and other organisms that carry out photosynthesis are phototrophs (or photoautotrophs). Bacteria that utilize the oxidation of inorganic compounds such as hydrogen sulfide, ammonium or ferrous iron as an energy source are chemoautotrophs (some are known as lithotrophs). Heterotrophy (Greek heterone = (an)other and trophe = nutrition) is the use by an organism of organic substrates to get its carbon for growth and development. A heterotroph is known as a consumer in the food chain. Contrast with autotrophs which use inorganic carbon dioxide or bicarbonate as sole carbon source. All animals are heterotrophic, as are fungi and many bacteria. An ecosystem is in ecological balance if all its biogeochemical cycles are able to complete their circuits. A saprobe (or saprotroph) is an organism that obtains its nutrients from non-living organic matter, usually dead and decaying plant or animal matter, by absorbing soluble organic compounds. Since saprotrophs cannot make food for themselves, they are considered a type of heterotroph. They include many fungi (the rest being parasitic, commensal or mutualistic symbionts), bacteria, and protozoa. Animal scavengers, such as dung beetles, vultures, and a few unusual non-photosynthetic plants are also sometimes referred to as saprotrophs, but are more commonly called saprophages. Decomposers and detritivores utilize energy from wastes or dead organisms, and so complete the cycle by returning nutrients to the soil or water, and carbon dioxide to the air and water. Producers (autotrophs) utilize energy from the sun and nutrients from the abiotic environment (carbon dioxide from the air or water, other nutrients from the soil or water) to perform photosynthesis and grow. Producers are generally green plants (those with chlorophyll). Consumers (heterotrophs) are organisms that feed on other organisms. In biology, agricultural science, physiology, and ecology, a limiting factor is one that controls a process, such as organism growth or species population size or distribution. The availability of food, predation pressure, or availability of shelter are examples of factors that could be limiting for a species population in a specific area. 11. Find a Spirit of Prophecy quotation and a Bible text pertinent to ecology and explain their relevance and application to our day. NOTE:These requirements may be expressed either verbally or in writing to a youth leader. An instructor is recommended but not required for this honor. Counsel with your youth leader or instructor before beginning requirements seven, eight and nine.